To make the most of the Cardians' effects, I tried to stuff as many of the ones that don't require a specific level Tribute in, with a few techs that don't mind getting dumped thrown in. Level Eater manipulates Cardians' Levels to ease certain Summoning conditions (for example, Level Eater-ing a Kiri lets you tribute it for the L11 Tuner; alternatively, Level Eater-ing an Ameshikou lets you Summon Susuki). The most interesting application of Level Eater is to abuse it to swarm the field with Ameshikous; each Level Eater basically means 1 less Cardian required to Summon it, thanks to the tuners' level manipulating effects not being limited to Cardian monsters. Also, if you somehow manage to get a Tuner on the field without getting restricted, you can use Level Eaters to make L4, 6, 8 or 10 Synchros such as Scarlight, Stardust, etc. Allure draws. RotA searches the starter, Matsu, as does One for One. The Warrior Returning Alive can nab a Yanagi, Susuki or Kiri that you Tributed for something else. The other Spells are in-house support. I could probably run Cupidity to thin the deck, but I just hate using the card. Who needs to deckbuild when you can just throw everything in? No Cheaters Allowed is sad. 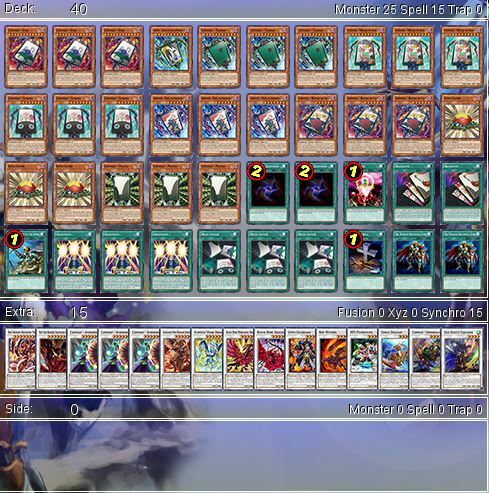 Frankly, No Cheaters Allowed is the only Cardian S/T that doesn't make the Deck more reliable when activated or dumped. I will say its effect is good enough to be sided though, as it stops Pendulum decks in its tracks. However, most other decks Special from the Extra/Deck or Graveyard, so it's not too useful against those. If only Konami would release about 4 more non-Nomi Cardians so that the Nomi Cardians' Summon effects would actually Summon something half the time... Also a bit strange that the latest 1000/1000 Cardians don't have counterparts. Last edited by ScionStorm; 14th July 2016 at 02:25 AM. That's actually rather clever to use Level Eater in such a way. I think you should run three Hanazumi. The ability to stack your deck is always valuable. I have to say, I've never thought of using Level Eater like you do. Good idea! I think I'll steal that for my Cardian deck. Personally, one of my favorite techs, suboptimal though it may be, is The Calculator. It gets up to incredible levels of ATK with a full field of Cardians. Naturally, you'd only want to run 1, since it's nigh-unsearchable in the deck, but I do recommend running one if you like huge beaters. For the first deck, every card I run helps put a Cardian on the field. I run 3 of every 1000/1000 and 100/100 to make the Cardian draw effects more reliable, but opt not to run the 2000/2000s because more often that not, they'd be dead in my hand unless Choukoikoi were in the Graveyard, or my draws were perfect. The only 2000/2000 I consider running is the L11, and only because it's a Tuner and Level 11 is one of the easier levels to achieve. I run 3 Level Eater to make it easier to find and dump them, since they aren't really searchable with anything but Foolish Burial. 2 Allures give the deck extra draw power (though it admittedly doesn't need it). 3 each of Choukoikoi and Hana Awase because they can both set up my board almost perfectly, though the former is riskier. They're also starters for my combos, since every Cardian but Matsu needs another Cardian on the field. One for One and RotA search out Matsu, which enables the Summon of every other Cardian but the L11 Tuner and also gives me a potential free draw. That comes out to 11 cards that can start my combos, plus two more to help me draw some more, plus two more that can stack my deck, which statistically means I'm very likely to not draw a dead hand turn 1 (~84.5%). Looking back on the Deck, I really should run 3 Hanazumis. I guess I was hesitant because it doesn't contribute directly to improving my hand or field, and Yanagi and Susuki shuffle my Deck anyway. The Foolish is there to help me dump those Level Eaters. The Warrior Returning Alive is basically another Cardian in my hand, and lets me pinpoint what I want to recycle. As for the Extra, I just threw in a bunch of even-Leveled Synchros I thought the Deck might want to use. The Black Roses can actually be Summoned by using Botan ni Cho + a Level Eater or Matsu, without using Botan's level manipulation effect (at least it should work, since Botan's effect includes "you can"). The Tyrant can actually be Summoned using 3 Level Eaters and two Cardian Tuners (or 2 Level Eaters, Ameshikou and two Cardian Tuners, or 2 L4 Botans and 2 Level Eaters), which is pretty funny. I think King Calamity can be Summoned if you Level Eater enough, with 2 Level 4 Botans/Coral Dragons and a Level 4 Scarlight, but good luck getting there. The Abyss is a relic from when I ran Glow-Up Bulb. As for additional tech options such as Advance Draw and Card Advance: They're interesting options, but I was hesitant to include them simply because they didn't immediately improve my first hand, which is my main concern with the techs, and that they make the Cardian cards' effects less reliable. Even with 22 Cardians in the Deck, with the first Matsu draw at 34 cards in the Deck, I'm only 50~61.76% likely to draw another Cardian (with 17 to 21 Cardians remaining in Deck) and not send it directly to the Graveyard. I'm actually considering dropping the Allures for more Michikazes, which would bump my Cardian count to 24, increasing those chances by about 5.5%. 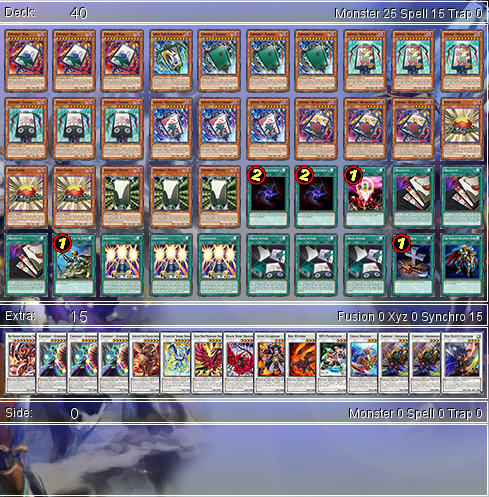 As for the Calculator, Ameshikou's 3000 ATK is enough against most decks, especially considering its immunities. 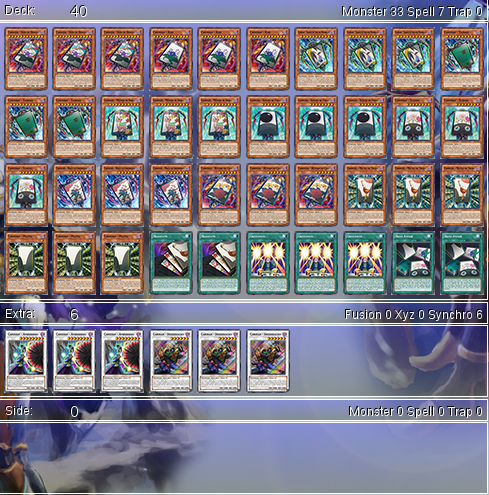 Also, the Deck can also just slowly beat down the opponent with Ameshikou's effect if they can't remove it. 3 Ameshikous = death in 2 turns for the enemy unless they're running Astral Force or (for some reason) Iron Core of the Koa'ki Meiru. Definitely stealing the Level Eater idea. As for other techs, I saw some people running some Shaddolls (that was back when Cardians first came out), like 3x Beast (Broww does the same as well) and maybe a Squamata or a Dragon (basically if you draw Beast or Squa with a Cardian's effect you can make that into a draw or w/e you like), although with the new cards we got now there's probably no room even if you wanted to run them. Since there's the lvl6 tuner now you could maybe throw in an Ultimaya in the Extra (along with a Crystal Wing), although it wouldn't be the easiest to get out with all the Cardian only restrictions. Other fun techs like The Calculator are Montage Dragon and United We Stand, which focus less on the Synchro aspect of the deck I guess and more on the beatdown. I love the Level Eater tech as well, it's pretty good in Cardians. But definitely max out on Warrior Returning Alive, that card can really win cames IMO. I'm hoping that we get more Cardians like Botan that SS by tributing any cardian, because I'd really like to drop Kiri, but can't because we still need Hana Awase too much. But once we get the next batch of them (if it ever happens), I'm pretty sure that the deck will start to take on a new form entirely.